Nowadays, it’s sadly rare that we are shocked by the WWE. Whether it’s Raw, Smackdown, even PPVs, it’s annoyingly easy to predict the outcome, and it’s been a long time since they’ve caught us off guard to any notable extent. The shows may elicit laughs, groans, even the odd yawn, but the so-called WWE Universe have got used to the same ol’, same ol’ and, for the most part, we don’t mind it too much. Punk may have quit just a few months ago, but he did so quietly, with no statement, no big moment, no huge reveal. Daniel Bryan finally won the championship, at arguably the best Wrestlemania event in years, but it was a long time coming, hard fought for and well-deserved. There was no sense that he was a victim of dumb luck, or that it wasn’t the right moment – it wasn’t a surprise, it was a reward. In fact, most of us would struggle to think of any moment, from the past year, that has genuinely shocked us. However, on an otherwise innocuous episode of Raw, right at the end, when it seemed things were wrapping up and winding down for the night, Seth Rollins turning against his brothers in The Shield did exactly that – and we still haven’t recovered. After two gloriously unspoiled years delivering justice, The Shield fell apart in a stunningly well-executed matter of moments. The setup was almost too easy, and given the sort-of surprise earlier in the show – Batista quitting and running back to Hollywood, as Triple H hilariously put it – we were lulled into a false sense of security, figuring the rest of the night would be by-the-numbers, even slightly dull. The so-called muscle of The Shield – and also, weirdly, the most softly spoken member – Roman Reigns was set to fight Evolution’s Randy Orton in the main event, which elicited shrugs of anticipation from those dulled by the boredom of this particular storyline. The Shield/Evolution feud had been shoved down fans’ throats for what felt like an eternity, and considering nobody cared about it much to begin with, by then it was really starting to grate. Batista leaving hinted the end was nigh, only for Triple H to emerge far too calm, as he accompanied Orton to the ring. Deep down, we knew it couldn’t really be over. It was too easy. As he boasted of a plan B, our hearts sank and our eyes rolled, as we resigned ourselves to the idea there was yet more to come. A split in The Shield was inevitable, and indeed it had been rumoured to happen for months, but not like this, and not because of Rollins, never Rollins. The Shield were a very simple tag team, with Reigns as the brawn, Dean Ambrose as the brain/lunatic and Rollins as their loyal follower, who stood behind them, nodding politely and sharing the spotlight whenever it was gifted to him. Looking back on their impressively quick rise to prominence, the way in which they fit so well together, bounced off each other and complimented one another cannot be under-stated, and they all played their parts very well. Trainer Joey Mercury, who has worked with The Shield separately and together since their NXT days, described them as “his babies”, noting their innate strength and incomparable understanding of each other in the ring. Each member has individually credited him for making them better, stronger and more honest as wrestlers, and for ultimately turning them into a team. We have watched them grow together, too, and although we knew it couldn’t last forever, it was probably always going to feel too soon for us. It seemed almost guaranteed that they’d split because of Ambrose’s ego, or wild temper, or even Reigns’ desire to be a star in his own right. If one had to guess which member of The Shield was the least likely to turn on his brothers, it would be Rollins without a doubt. 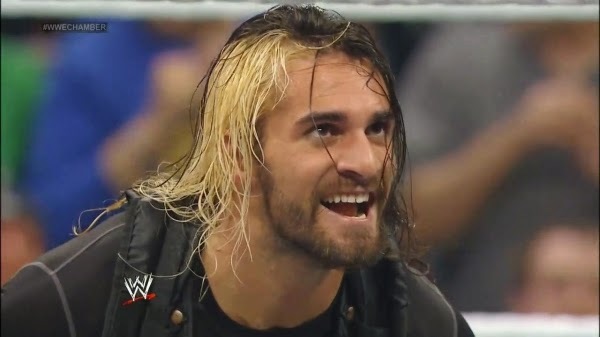 Rollins was the old reliable, the chatty, happy one who nodded in the background the whole time and only went against his team-mates once, maybe twice in fleeting, throwaway moments of frustration. At the close of the preceding week’s Raw, The Shield posed in triumphant unity next to a battered Triple H and his infamous sledgehammer. It was a remarkable moment – and a memorably great shot for the on-point cameraman/men, along with those of us watching at home – that solidified what this team meant to each other, and to us. The following week, that exact shot would be replicated almost to the letter, with Reigns and Ambrose lying in pieces on the mat, and Rollins, Trips and Orton standing over them with the sledgehammer in hand – the symbolism is so blatant, it’d be annoying if it weren’t so completely brilliant. Rollins’ heel turn was remarkable for many reasons, but the fact the shock-waves are still being felt weeks later, exemplifies how much pull The Shield have with the fans, and how much heat they created during their two year reign. Arguably the most popular, and successful, tag team in years, they managed to get a massive reaction as both heels and faces. Crucially, we never got sick of, or bored with, them and the three of them were equally well-liked and supported (especially on Tumblr). Regardless of what’s to come, it’s unlikely the shock is going to wear off any time soon, and in this way, Rollins himself has managed to do something really special, because he’s affected everything, and everyone, around him with one simple, perfectly-executed move delivered at the least obvious moment imaginable. He made a small attempt to explain himself on the following week’s Raw, while on the following episode Rollins fully emerged as his own person, challenging his ex-team-mates – both of whom are establishing themselves as individuals, also – and interfering wherever he could. Back in January, it would’ve been difficult to envision The Shield splitting up at all, let alone gearing up to fight each other at the next PPV – it seems an Ambrose/Rollins match-up is on the horizon, if the latest Raw is any indication – but what’s perhaps most shocking about this development is how exciting of a prospect that is. If it happens, Ambrose/Rollins will probably be the most anticipated match of Money In The Bank. Who could’ve predicted that!? The match started out with Adam Rose prancing around ring but Camacho hit him with a clothesline. Camacho hit a huge double underhook suplex. Later in the match, Rose hits a very nice double A Spinebuster and after this the crowd chants, "We are rosebuds!". Rose wins with his own version of a headlock driver. This match was an ok match but the crowd was really into Rose. in taking out the Ascension. Local hit a very nice second rope moonsault for a 2 count on Victor. Eventually the Ascension hit their tag team finisher to retain their titles. This was a good match as I thought The Ascension were good and the crowd was into the entire match. The match starts out both by both men using arm locks on each other. Zayn goes up on the second rope and goes for a boot to the face but Breeze catches it and swings it over the ropes and Zayn falls to the floor. Zayn throws Breeze out of the ring and he hits springboard moonsault out to the floor. Breeze tries to get away from Zayn but Zayn hits the Blue Thunder Bomb. Later in the match Breeze hits a brutal Alley Oop Bomb for a 2 count. Breeze hits an very nice superkick to Zayn after both guys kept reversing each others waist locks. Zayn misses the Helloova kick and hurts his groin. Breeze then hits his finisher the Beauty Shot which is a spinning heel kick for the victory. This was an amazing match as Zayn pulled out a couple of different that wowed the crowd and Breeze showed his aggression and ability in the ring. Rawley insults Rusev and runs into the ring but is hit with a nasty looking superkick. Rusev put him into the Acolade. Rusev then put Rawley in the Acolade on the entrance ramp. This wasn't even a match as Rusev came out and then Rawley came out and Rusev just beat up Rawley. Paige comes out and thanks all the fans who come out to NXT. Paige then says how worthy you have to be to hold the NXT Women's title. The match starts out with some very good technical wrestling as neither woman can gain momentum. Natalya gets a wheel barrel pin but Charlotte kicks out at 2. Charlotte hits a signature Flair chop and Flair starts doing the strut on the outside. Natalya puts Charlotte in a sleeper but Charlotte hits a very nice backpack stunner to break the hold. Natalya hits a very nice stomp to the head and dropkick combo while Charlotte is sitting. Charlotte does a top rope moonsault but Natalya moves out of the way just in time. Charlotte reverses a sharpshooter into a figure four leg lock and then roll around to the floor. Charlotte then leans down off of the apron and keeps the hold applied like Bret Hart would do except he did that with the ring post. Charlotte wins with the front flip face crusher. This was one of the best women's match I have ever seen as both women were both using very good technical wrestling. The match starts with a lot of technical wrestling but Kidd has the upper hand for a lot of it. As both men get more speed Kidd and Neville begin to mirror each other moves. Kidd throws Neville out of the ring and Kidd hits a plancha through the middle rope on Neville. When both men are back in the ring they hit cross bodies on each other leaving both guys laid out. Kidd goes for powerbomb off of the top rope but Neville reverses it by back flipping off of the second rope. Kidd then runs a Neville but then throws him up and hits a tiger bomb for a 2 count. Neville goes for a middle rope springboard but Kidd jumps up with him and hits a side Russian leg sweep off of the middle rope. Neville then vertical suplexes Kidd over the top rope and both men go to the floor. Neville hits a Rana off of the top rope and then hits his finisher off the top rope for the victory. This a was an awesome match as both guys were so similar in style but also pulled out things that wowed the fans. Overall this was an amazing show. I believe this show was better than NXT Arrival and had the best match I saw in NXT in Zayn vs. Breeze.